This beautiful trullo was restored by the owner until recently, although the former farmhouse intentionally left in its original layout was. 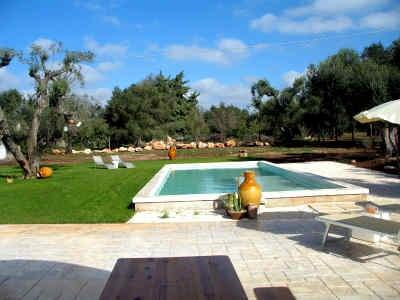 Trullo Specchia disposes of the main house and to reach outside by the charming little courtyard a large kitchen and then a double room with a small shower room. All rooms have been aware spartan but tastefully decorated, to feel more the typical flair of this homes.The courtyard and the adjacent small garden invite you to relax. to read a good book or just to eat al fresco. Over a footpath that leads through the extensive grounds, you reach a small lookout point that offers a marvelous view of Cisterniono and the sea.Trullo Specchia is an ideal base to explore the many attractions of this region, as Alberoblello, the white town of Ostuni, the charming city of Lecce and of course, the mile-long coast of Puglia. Price includes water, electricity, gas for cooking, bedlinen, towels, final cleaning. Payable on site: security deposit € 100,00, heating costs on request.